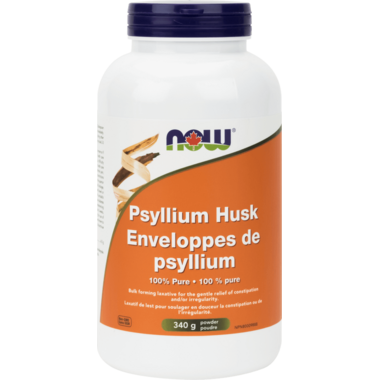 NOW Foods Psyllium Husk Powder is a bulk forming laxative for the gentle relief of constipation and/or irregularity. Psyllium is a true dietary fiber, even though it is classified by some as a laxative or mucilaginous fiber, and is a convenient way to increase intake of dietary fiber because of its high mucilage content. This bulking agent swells considerably when added to liquid, which can help to support healthy gastrointestinal transit time. This bulking action and healthy transit time can play an important role in maintaining healthy gastrointestinal function. Caution: Consult a health care practitioner if symptoms worsen or if laxative effect does not occur within seven days. Consult a health care practitioner immediately if you experience chest pain, vomiting, or difficulty in swallowing or breathing after taking this product. Consult a health care practitioner prior to use if you have symptoms such as abdominal pain, nausea, vomiting or fever (as these could be signs of abnormal constrictions of the gastrointestinal tract, diseases of the oesophagus and/or the superior opening of the stomach (cardia), potential or existing intestinal blockage, paralysis of the intestine, megacolon, faecal impaction, inflamed bowel or appendicitis), or if you are taking medications which inhibit peristaltic movement. Do not use if you have difficulty swallowing, if you have diabetes mellitus in which blood sugar is difficult to regulate, or if you are experiencing a sudden change in bowel habits that has persisted for more than 2 weeks, undiagnosed rectal bleeding, or failure to defaecate following the use of another laxative product. Hypersensitivity, such as allergy, has been known to occur following inhaled and/or ingested psyllium; in which case, discontinue use. May cause temporary gas and/or bloating. I love that this is a powder. I mix it with Chocolate Almond milk using a frother and it is perfect. Great source of fibre and very different from psyllium husks. I add it to recipes. I agree with the previous reviewer who said that it does not mix well into water. I haven't been able to successfully mix it with water and drink it at all. It just absorbs the water and turns into a lumpy mess no matter how fast I stir it in and try to drink it. I have had much better success mixing it into food items in smaller amounts. It works well when added to instant oatmeal (with a little cinnamon for extra flavor) or into purÃ©ed fruit/apple sauce. You can also add a little bit into something like pasta sauce. Overall, this is a good product but I can't give it a 5 out of 5 due to the trouble I've had trying to mix it with liquid to drink. Really very good supplement for extra fibres. Ingredients are pure, no sugar added. Does not mix well at all into water. Absorbs water within a few seconds, making it impossible to mix in and drink a full glass of water before it solidifies. What a great product! It works like magic, is easy to take in a glass of water and very portable. I have been an all bran user for years, but decided to find something smaller and lighter for traveling overseas this summer. The bottle is perfect( it can be tucked inside any corner of the suitcase) and the dose (1 tablespoon of concentrated psyllium powder a day) means that the bottle can last me for the duration of my travel. Thank you, Well.Ca for the prompt delivery!